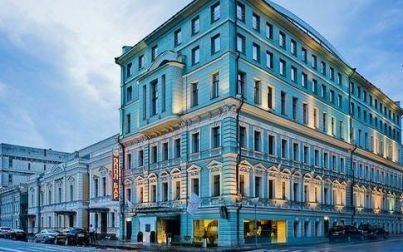 A unique and stylish boutique hotel in Moscow, well placed within the central business district, surrounded by restaurants, shopping, theaters, museums and nightlife. It is within walking distance to the Kremlin and Red Square. The hotel’s style is based on the unique twist of modern interiors and distinctive design within the space of a classical historical building. Two guest elevators make way to the guests’ floors; each floor has a different color, drawing together a composition of a bright rainbow against a grey background creating a fresh modern feel. The contemporary, elegant and comfortable interiors make it individual and unique. Clean lines and modern interiors here at the boutique hotel make way for comfortable guestrooms that seal out the city noise. A palette of Philippe Stark fixtures and accessories in the bathroom coexist with minimalist custom made furniture in the bedroom, generating cool and weightless interiors. The hotel accommodations consist of 92 guestrooms including standard rooms, superior rooms, deluxe rooms and penthouse apartments. The bedrooms are all medium in size. The bathrooms in standard rooms are shower only. Superior and deluxe rooms have bath tubs. Exclusively appointed, two stunning penthouses offer an added comfort featuring plasma panoramic wide-screen television, private sauna and a cute kitchenette. The hotel enjoys a central location close to international business centers, government offices, top shopping and dining places, theatres, art galleries and museums. Close by are cultural landmarks such as the Kremlin, the Red Square and the Bolshoy Theatre. The Hotel is also just steps away from the Hermitage Garden.